By reader request we’re featuring great new music — both albums and videos — from time to time. Suggestions? Drop them in the comments and we’ll give ’em a listen. Listen: full stream on Spotify; partial stream at All Music; buy on Amazon or iTunes. Standouts: the Piano Suites. Listen sequentially, or start with the third if you’re short on time. George Enescu was a Romanian composer, pianist and violinist. He lived from 1881-1955, and the god Pablo Casals called him “one of the greatest geniuses of modern music.” If you ever find yourself in Bucharest immediately head to Cantacuzino Palace, Enescu’s former residence (the guy lived large, like MTV Cribs-level), now home to the George Enescu Museum. Enescu wrote symphonies, operas, string quartets, songs, and more. 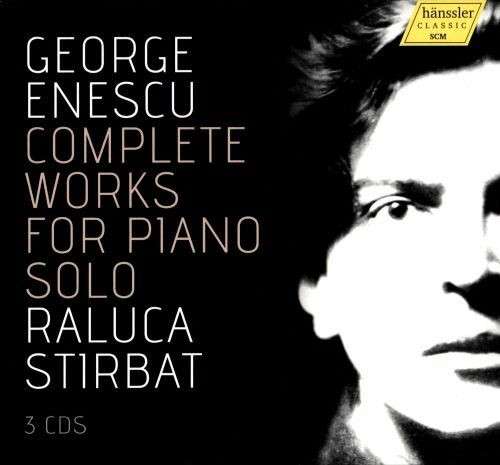 Complete Works is a perfect intro, a concise thesis, for the Enescu output. In Suite No. 3 alone you get Liszt-ian flourishes (“Appassionato”), masterful, slow Beethovenian progression (“Choral”), and writing of such technical piano wizardry (“Burlesque”) you’d think Chopin conjured it. To top it off, the “Carillon Nocturne” is sweetly dissonant, like a hit of something exciting and slightly illicit. Raluca Stirbat is our Enescu spirit guide. Stirbat is a fellow Romanian (though not a contemporary), a one-time soloist with the George Enescu Philharmonie, and former student at the George Enescu Music Academy. Listening to the complete piano works of any composer is a marathon-type endeavor. But Stirbat makes it easy. Her playing is sensitive, insistent, and (most important) pliable — Stirbat tempers Enescu’s bombast with moments of repose and recovery, the kind of switch-backs that live or die with a performer’s mastery. The pairing is effective, and the project addictive.